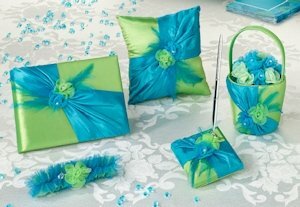 Inspired by the colors of the sea and sky, this blue and green set of wedding accessories is eye catching. The vibrant Blue & Green collection includes five lovely items, each of which may also be available separately. The collection is comprised of a flower basket, guest, book, pen set, ring pillow and garter. This set will give your wedding the cool colors you love.